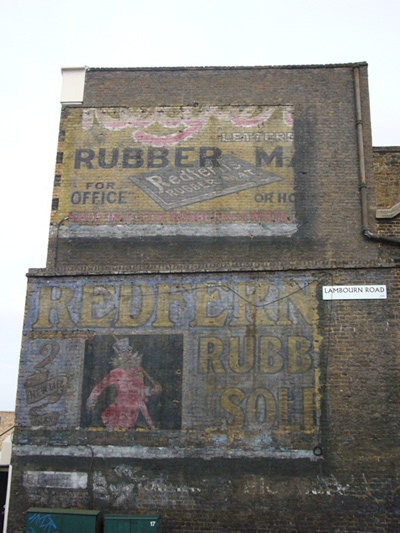 They once covered walls across the country with brightly coloured advertising and promotions. 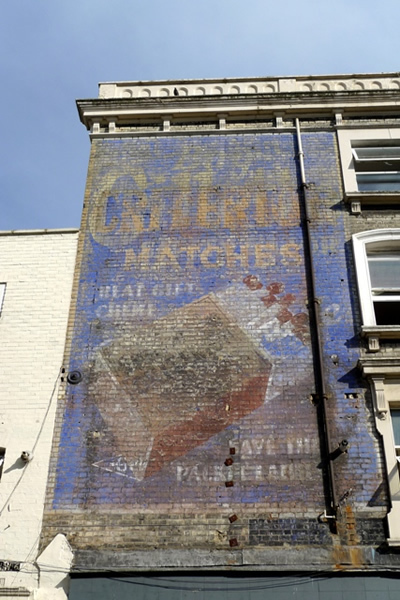 Their demise, which continues to this day, has been profound but an army of photographers have been working to create a lasting record of these signs of old, commonly known as ‘ghostsigns’. 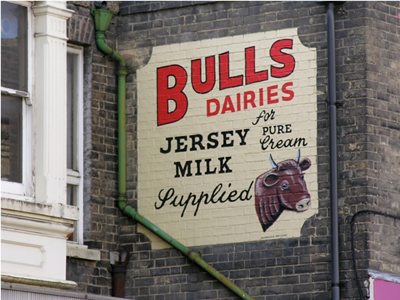 The once popular medium of hand painted advertising on walls hasn’t been used in any significant way for some time. Advances in technology and the economics of production have left the signs and those who once produced them largely redundant. However, many of these pieces of advertising that were once crafted by hand in all weathers have survived well beyond their ‘sell by’ date. 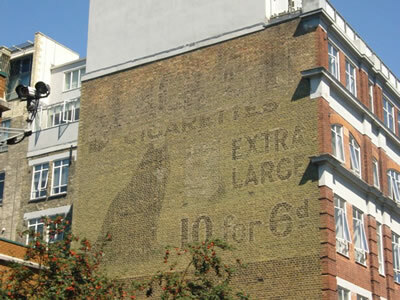 Advertising is typically ephemeral in nature but these signs have endured, and through them we are offered a window into the past, a glimpse into a different time when smoking benefited your throat and people took their pens to be repaired. 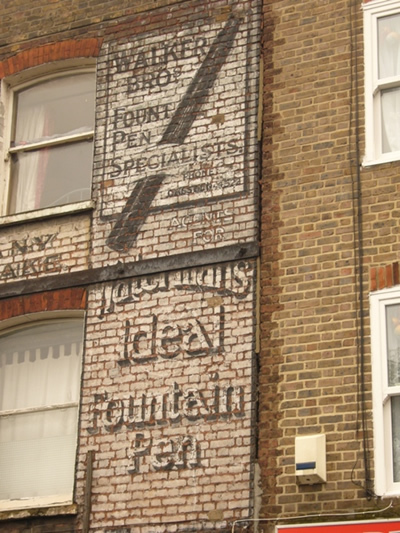 The walls on which these signs appear were either leased directly by the property owner or on their behalf by a local agent (a site on Vauxhall Bridge Road, London, in 1914 cost £30 to hire for a year). The duration of these arrangements were measured in years, in stark contrast to today’s billboards which are typically booked in fortnightly blocks. This shift in duration is in keeping with wider trends in advertising and communications: the ancient Egyptians chiselled their signs into stone lasting millennia, while television and, even more recently, digital media provide advertisers with exposure lasting only a matter of seconds. These hand painted signs exist between these two extremes, symbolic of the longer term intent of the companies using them to advertise. 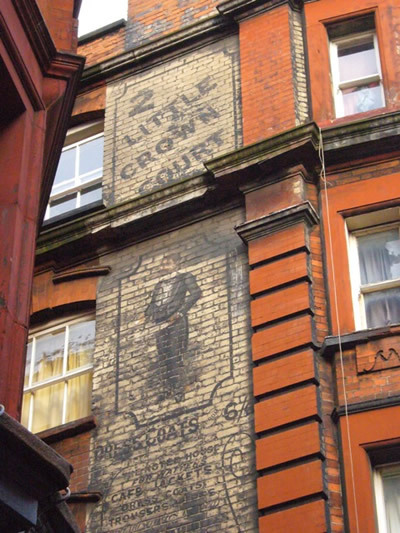 Adding to their longevity was the use of lead paints whose lead content peaked at a time when hand painted signs were common, the period 1930-1955. As the use of large printed billboards increased in the 1950s and 1960s the economics of production led to hand painted signs being cast aside. In addition to the lower costs of printing posters, advertisers were also offered the benefit of faithfully reproduced designs across multiple locations. This could not be assured with the hand painted form because of the individual approaches of particular signwriters. While advertising departments of clients and their agencies would have created designs to guide the signwriters they were required to offer some discretion to account for the huge variety in the size and dimensions of wall spaces available. The colours used may also have been subject to variation, especially if these were not specifically dictated alongside the design. In many cases the signs feature brands with which we are still familiar: Hovis; Gillette; Nestle; Twinings; Boots. 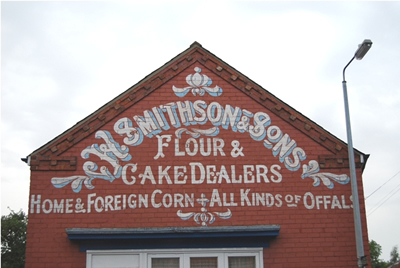 They also showcase names which have ceased to exist since the signwriter scaled the wall to apply the paint: Black Cat Cigarettes; Peterkin’s Custard; Bile Beans; Turog Bread. In both cases signs and their messages have survived while many more have been lost, either permanently or on a more temporary basis. The most obvious ongoing threat to the survival of the signs is the weather that continually erodes their hues. Where walls have had multiple signs painted one on top of the other the weathering has the effect of wearing away at the most recent sign, only for the older paintwork to become increasingly visible. These palimpsests offer layers of text which sometimes appear to promote ‘hybrid’ products, such as Gillette Matches (a combination of signs for Gillette Razors and Criterion Matches), which have never existed. A more dramatic and conclusive means by which signs are lost is the destruction of the buildings on which they are painted. Related to this is the erection of buildings on adjacent land which can cover a sign. 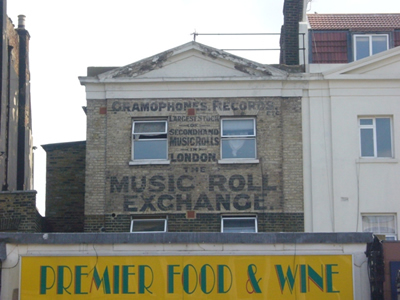 This is only as lasting as the new building and, particularly in the USA, there are many examples where the destruction of a building has revealed a very well preserved ghostsign on one of its neighbours. A similar effect is achieved when a sign is covered by a billboard. This is very common because their locations are often on highly visible patches of wall which advertisers continue to exploit, only with printed rather than painted advertisements. The current evolution of outdoor media and resulting replacement of billboards with electronic displays has led to signs be exposed once again, albeit for only a matter of days. Property developers not only destroy host buildings but they are also responsible for sandblasting or painting over signwritten walls. In the case of the latter it is possible to ‘restore’ the original sign through the chemical removal of the new paint, especially where the paint used for the original sign has saturated into the porous bricks underneath. Paint is used in a different way by those wishing to restore signs to their former glory. Recreating the brilliance of the colours and the messages being conveyed offers some insight into how striking these advertisements were when they were fresh and young. However, something is lost in doing so. The position the signs hold within individual and collective memories relates in some way to the survival of the decaying original rather than any attempt to restore it. While the signs would have received fresh coats of paint when they served a genuine functional purpose, there is a superficiality reapplying the paint when the sign is devoid of this purpose. There is much to commend in this response, although it is difficult to imagine what will survive from the current era of replaceable billboards and digital displays. Further, it is interesting that the value placed upon the craft of signwriting is in some way diminished versus crafts which created more permanent artefacts such as furniture and jewellery. Many of these signs are close to becoming antique, yet the skill involved in producing them is valued less than that of the cabinet maker. One way of ‘saving’ the signs is through photography. While photographs cannot substitute seeing signs in person, they do allow us to appreciate their scale, the skill that went into their production and the essential components of their design and layout. 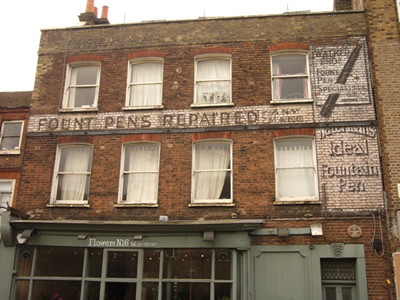 Numerous photographers, both professional and amateur, have pointed their lenses at ghostsigns. 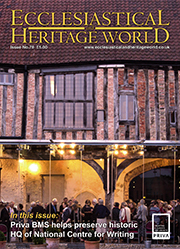 They arouse interest in many people for lots of reasons and it is possible to approach them as subject matter from such diverse perspectives as their place in industrial history through to the lettering styles employed and the relationships between these and typographical forms. This is not to mention their place in the fabric of local communities where they serve as way markers and sources of intrigue. For the last year or so a group of enthusiasts have been collaborating to create a permanent photographic archive of signs from across the UK and Ireland. This is being hosted by the History of Advertising Trust, offering a valuable resource for researchers, students and other interested people. 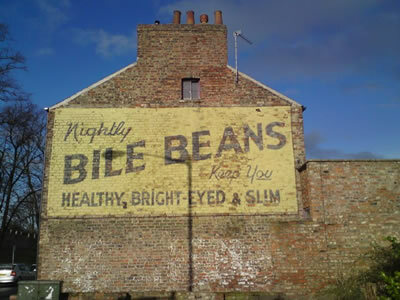 The archive features over 600 signs from big cities and small villages, in all shapes and sizes, advertising the familiar and unfamiliar alike. It is free to access, online and searchable to allow the greatest access and flexibility for those using it. The signs may be fading but they have now been saved and given a new home in a much more contemporary setting. 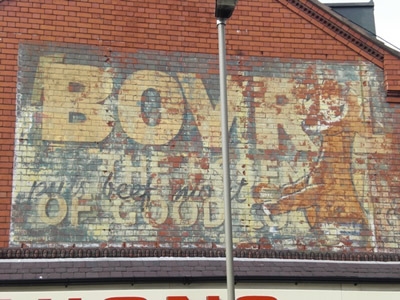 Sam Roberts has been leading the ghostsigns project on behalf of the History of Advertising Trust. More information about the archive can be found via the project website, www.ghostsigns.co.uk, and the archive is available via the History of Advertising Trust website, www.hatads.org.uk.